(Nanowerk News) A quantum mechanical transport phenomenon demonstrated for the first time in synthetic, atomically-thin layered material at room temperature could lead to novel nanoelectronic circuits and devices, according to researchers at Penn State and three other U.S. and international universities. Current-voltage curves of single junction (green) van der Waals solid (no NDR) and multijunction (red, orange) van der Waals solids (NDR). Stacking and choice of materials determines the location and width of peak. “Theory suggests that stacking two-dimensional layers of different materials one atop the other can lead to new materials with new phenomena,” says Joshua Robinson, a Penn State assistant professor of materials science and engineering whose student, Yu-Chuan Lin, is first author on a paper appearing online today, June 19, in the journal Nature Communications ("Atomically Thin Resonant Tunnel Diodes built from Synthetic van der Waals Heterostructures"). 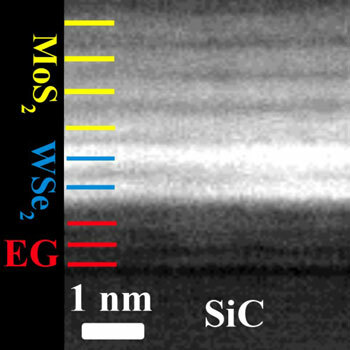 Achieving NDR in a resonant tunneling diode at room temperature requires nearly perfect interfaces, which are possible using direct growth techniques, in this case oxide vaporization of molybdenum oxide in the presence of sulfur vapor to make the MoS2 layer, and metal organic chemical vapor deposition to make the WSe2 and MoSe2. What caught Lin and Robinson’s attention was a sharp peak and valley in their electrical measurements where there would normally be a regular upward slope. Any unexpected phenomenon, if it is repeatable, is of interest, Robinson says. To explain their results, they consulted an expert in nanoscale electronic devices, Suman Datta, who told them they were seeing a 2D version of a resonant tunneling diode, a quantum mechanical device that operates at low power. Atomic multilayer structure of van der Waals solids representing layering with a graphene substrate. Coauthor Robert Wallace of the University of Texas at Dallas says this collaborative work represents an important achievement in the realization of useful 2D integrated circuits. “The ability to observe the resonant behavior at room temperature with synthesized 2D materials rather than exfoliated, stacked flakes is exciting as it points toward the possibilities for scalable device fabrication methods that are more compatible with industrial interests. The challenge we now must address includes improving the grown 2D materials further and obtaining better performance for future device applications,” says Wallace. 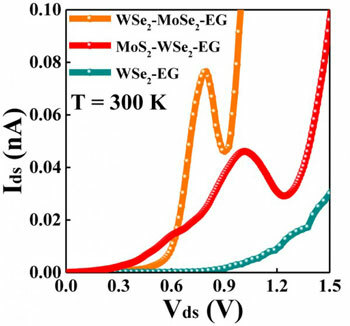 The UT-Dallas coauthors provided the detailed atomic resolution materials characterization for the resonant tunneling diodes discovered at Penn State.